How could anyone have designed the largest cruise liner of all time to have a shortfall of some fifty berths? Bookings had been taken for months, and the maiden voyage just two weeks away. The liner’s owners were in discussions with their legal counsel as to how to proceed with a claim for negligence and misrepresentation, not to mention the lack of revenue and public ridicule at not being able to deliver on their proud boast of the Cruise of a Life Time. It was being tagged the Cruise of a Life Line in the press and something had to be done to stop them becoming the laughing stock of the seas. 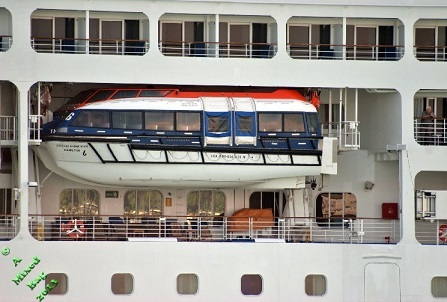 A young architect came up with the idea of utilising the life boats as personal dining spaces, and thus converting what had been dining room booths into inner cabins. It was a long shot, but the designers were confident it could be done in the remaining time frame and set to making it happen. It was just hoped that the maiden voyage didn’t go the same way as Titanic, as they only had one set of life boats to adapt. This entry was posted in #flash fiction, blogging, Challenge and tagged Sunday Photo Fiction. Bookmark the permalink. I’m not sure that’s a good idea! Great little tale. Glad you liked it Keith. Time (and money) is of the essence of course! The Titanic did have a sister ship The Britannic which also sunk, but more were rescued due to a number of favorable factors. Hi James. Thanks for commenting. Lovely to hear from you. Or maybe wait until for ‘the next one’! Lateral thinking, if ever there were an example. Good one. Very clever interpretation of the prompt, P101. Hope nothing happens to the ship. Good story. Hopefully they won’t need to use the lifeboats for the reason they were designed.